Some of the most powerful yet harrowing images to emerge from 2015 was of the small, yet colourful West African country of Sierra Leone. Ebola at the time had gripped the country and life was spared little mercy. It seemed unfair that after recovering from a such a protracted and brutal civil war, Sierra Leoneans had to face yet another obstacle in their development; one cruel hurdle after the next. And yet, the country rallied and the people proved once more their determination. Over the past eighteen months, I worked alongside the International Federation of Red Cross and Red Crescent Societies (IFRC) as Youth Affairs Officer for the United Nations Development Programme (UNDP) in Sierra Leone. My primary objectives are the improvement of livelihoods and psychological wellbeing for the 1,300 people who served in the safe and dignified burial teams (SDB) of the Ebola response. 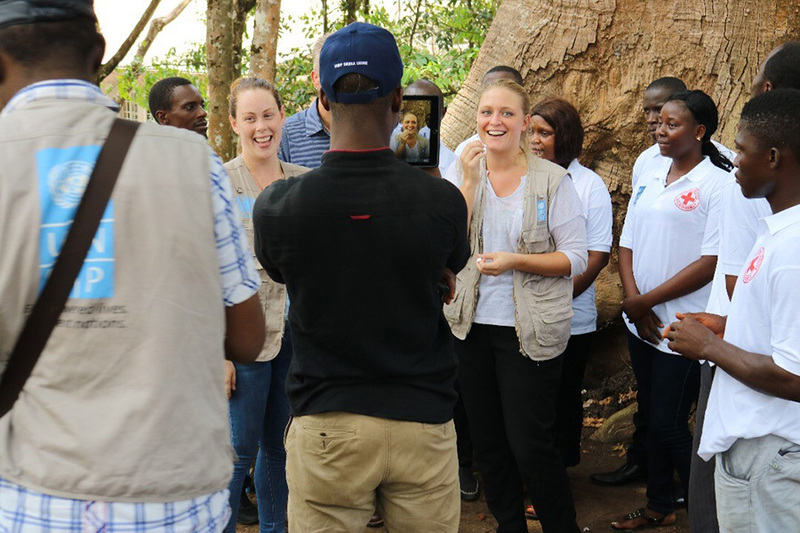 Reskilling and reintegration of these volunteers into their communities is part of UNDP's “Restoring Livelihoods and Economic and Social Recovery Programme” in n Sierra Leone, which aims to compliment the Government's “Post Ebola Recovery Plan”. Stimulating the economy through economic activities has been paramount to the success of the programme. A total of 16,200 people volunteered as Ebola response workers during the crisis. Those dressed head to toe in protection suits gained the most notoriety. Known as the safe and dignified burial teams (SDB) these volunteers quickly became an integral aspect in the response efforts and critical in halting the spread of the disease. When the country was finally declared Ebola free in 2016 these men and women reintegrated their communities but the fear of contagion persisted and finding suitable employment remained a challenge. And so, it came to pass that as my first role and placement as UN Youth Volunteer with UNDP would be to work alongside these men and women helping them back to work and society through a nationwide ‘reintegration and re-skilling’ project. The majority of the burial team members lost their jobs during Ebola; schools were shut, universities closed and people lost their businesses. We want to help them return to the lives they had before the outbreak. My efforts have been largely devoted to coordinating with the team the various skills training packages on offer to the volunteers. Ranging from business start-up packages, vocational training, internships, financial inclusion, as well as educational support for University education students, the project has endeavoured to equip the volunteers with new skill sets that would be essential for improved livelihoods. Honestly speaking, anybody working in livelihoods will know that it’s a tough area to guarantee full success, especially in the context of low economic activity. That being said, the project has laid the foundation for the volunteers to be self reliant and contribute positively to the country’s development. Lasting socioeconomic impacts are expected to be felt by each volunteer as they transit to better management of their own affairs as a result of the skills and knowledge acquired over the past eighteen months. While the images of the EVD response will remain with us , the importance of looking to the future is paramount. When I decided to capture the volunteers lives after Ebola (in an Exposure photo story published by UNDP Sierra Leone) I wanted to counter the harrowing depictions of struggle and fear that the disease embodied and (replace them with) convey a new found zeal for progress. Reflecting on my time spent in Sierra Leone I consider myself honoured and humbled to have served as a UN Volunteer for these people and feel that a genuine effort has been made by both UNDP and IFRC to recognise their efforts, sacrifices and contributions. Discover the "Unsung heroes" of the Ebola crisis, re-integrated into their communities. Get to know more about the work of the Ebola Burial Team in Sierra Leone, by watching this one minute video.